There is an error with this recipe on page 24 of the Spelt book. All good artisan bakers have their favourite way of baking a sourdough. 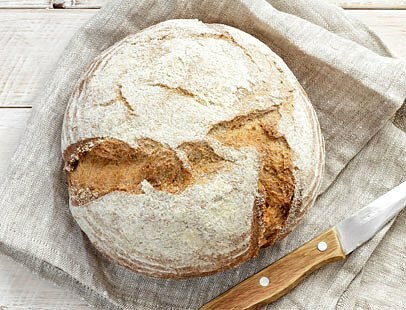 The recipe I have chosen below was created by Vanessa Kimbell, who I think of as the Sourdough Queen of England! Ideally you'll need a round cane banneton, or a colander and a clean tea towel. For perfect results, use a cloche, although you can use a baking stone with a pan of hot water underneath. You can use any blend of white and wholegrain flour. Make the sourdough leaven in the evening the day before you bake. Mix together the starter, flour and 50ml/1½fl oz/3 tbsp filtered water, cover and leave for 8 hours until lively and bubbly. Early in the morning, whisk the sourdough leaven with 300ml/10fl oz/1¼ cups water in a large bowl. Add the spelt flours and salt and mix until the ingredients come together in a large ball. Cover with a clean, damp cloth and leave to rest in a cool environment for 2 hours. Lift and fold the dough over itself and then do a quarter turn of the bowl, repeat 3 times. Do this 4 times over 2 hours. Leave your dough to prove for about 1 hour until the dough has risen by 75 per cent. Do not wait for it to double as it will be over-proved. Preheat the oven to 220°C/425°F/Gas 7 for at least 30 minutes. Dust your cloche with a fine layer of semolina, put the dough in the cloche and slash the top so the bread splits along the lines of the cut. Put on the lid and bake for 40 minutes. Turn the heat down to 180°C/350°F/Gas 4. Remove the lid and bake for another 15-20 minutes until the crust is dark brown. Leave to cool completely before slicing. If you like a soft crust, wrap the bread in a clean tea towel while still warm. Once cool, store in a linen or cotton bread bag, or wrapped in a clean tea towel. It improves if left for a day to let the full flavour develop.